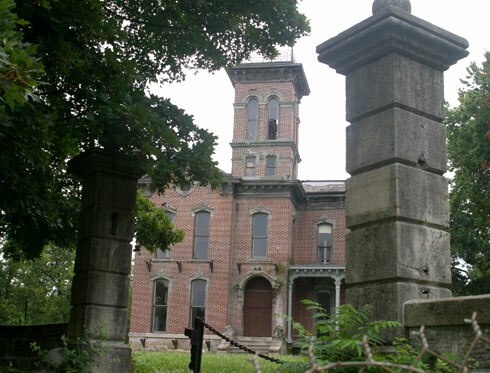 Sauer castle was built in 1871 by Anton sauer alongthe Shawnee Indian trail that was part of the old Santa Fe Trail. Five generations of the Sauer family lived in the house until the death of Eve Maria Sauer in 1955. The house was sold shortly after that and has passed through several owners hands until the present day where it is privately owned. In 1977 the house was placed in the register of historic Kansas places and also the national register of historic places. If theres one thing i dont like about haunted places its that the original story can get altered so much that people end up making a whole new story to it which includes things that never happened. It would seem that Sauer castle has been subjected to quite large amounts of spooky stories over the years. The house has been broken into and vandalised quite a few times by kids who just want a look inside. The house holds many tales but one of the oldest and most common is the story of how one of the owners of the house left to fight in the civil war and told his wife to wait for his return. She was instructed to wait for a particular ferry he would be coming home on but when he wasnt there she thought he had been killed and went and hung herself in the house bell tower. Turns out that he simply missed his ferry and when he got home to find his love had died, he to killed himself. The bell tower of the house is were most of the activity is spotted. Strange lights and noises come from this area quite often, also emotional sounds can be heard from all over the house, such as crying and muffled shouting sounds. It would'nt be worth it to list the dozens of other stories which are connected with the house as these have been made up by thrill seekers and people who illegally break into the house in the hopes of seeing something.